The Tangs exposed a variety of human cancer cells to toxins such as ethanol and waited for long-established signs of apoptosis, such as caspase activation and cell shrinking. Next, instead of throwing away the “dead” cells at the end of the experiment, “we washed and incubated them with fresh medium overnight,” says Tang. It doesn’t seem to matter how apoptosis started. If good conditions are restored, anastasis can rescue cells following a variety of insults. “Surprisingly, some cells had regained normal morphology when we looked at them the following morning.”1 The siblings named this phenomenon anastasis. 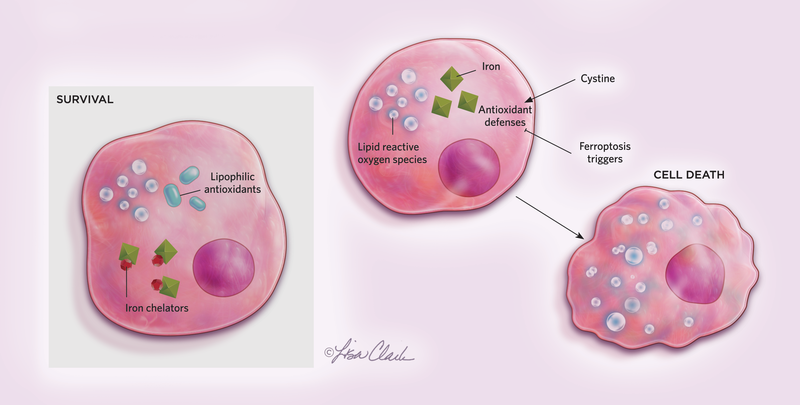 Apoptosis means “falling” in Greek, and the process facilitates the natural turnover of cells, akin to petals falling from a fading flower or leaves from a tree in autumn. Anastasis, on the other hand, means “rising,” and in Christianity refers to the resurrection of Jesus. The research community was initially skeptical that cells could come back from the dead. “Our finding was quite controversial—one of our first few papers got rejected more than 11 times in three years,” says Tang, now a molecular and genetic biologist at Johns Hopkins University. Since 2012, when anastasis was formally named, researchers have delved deeper into precisely how cells apparently can stitch themselves back together after being badly damaged by apoptosis. 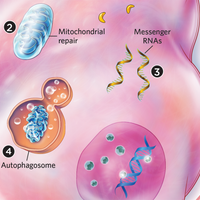 Scientists have witnessed fragmented mitochondria in cultured human cells become whole again, and caches of mRNAs created and held in reserve during apoptosis to help jump-start cells back to life. They have also found evidence that anastasis can occur in vivo in Drosophila. A SECOND LIFE: Live cell confocal microscopy of human cervical cancer HeLa cells before cell death induction (top), treated with ethanol to induce cell death (middle), and after washing and incubating with fresh medium to allow recovery for 30 hours (bottom). Mitochondria are stained in red, nuclei in blue. Cells can live for days, months, even years, but once apoptosis starts, it takes no time at all for death to set in. Within 10 minutes of caspase activation, the cell visibly transforms: its membrane distorts as the cell shrinks, and its DNA condenses into bundles that then break apart. Caspases also cause a molecule known as phosphatidylserine to flip from the inner to the outer surface of the cell membrane, serving as an “eat me” signal for phagocytic cells. (See illustration.) “You activate these caspases like hired killers, which cleave maybe several hundred substrates in cells and kill cells within five to ten minutes,” says Gabriel Ichim, a cell biologist at the University of Lyon in France. Like anastasis, failed apoptosis shows that the initiation of apoptosis is not the death sentence it is often thought to be, says Tait. 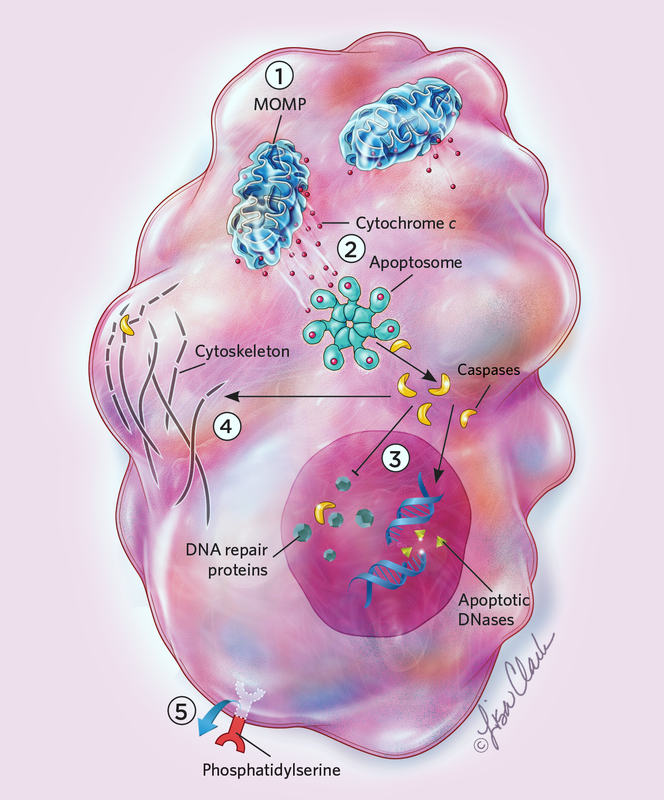 But failed apoptosis involves cells that only partially go through apoptosis—the levels of active caspases are much lower than when apoptosis is successful, and only a limited number of the enzymes’ key targets are cleaved. In contrast, the Tangs’ findings suggest that cells can even recover when apoptosis is full-blown, Tait says. As much as scientists in the past decade have suggested that apoptosis is not always final, there is still widespread skepticism regarding these results. One reason anastasis remains controversial is the question of whether or not cells seen alive after exposure to apoptosis-inducing stressors actually experienced caspase activation, or whether they avoided the stressor that would have activated the executioners. Cells that undergo anastasis can also be indistinguishable from surrounding healthy cells. “It’s a real challenge to track these surviving cells in the long term, especially in vivo,” Ichim says. To monitor cell survival in vivo after apoptosis is initiated, the Tangs and Montell independently developed gene constructs—CaspaseTracker7 in 2015 and CasExpress8 in 2016, respectively—that generate fluorescent proteins during caspase activation, and then fluoresce another color indefinitely thereafter. 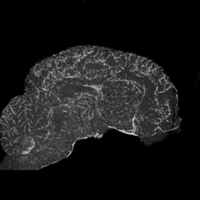 Single-cell and time-lapse live-cell microscopy then tracks cell fate. This approach helped the teams observe anastasis in vivo for the first time. Using these constructs, the Tangs and Montell have seen cells in multiple types of tissues in Drosophila embryos experience caspase activation before recovering completely after the appearance of apoptosis’s usual hallmarks, such as cell shrinking and membrane blebbing. The researchers are now working to see if these findings hold true in rodents. The results are still not widely accepted, in part because previous research has shown that caspases contribute to processes other than cell death. For instance, in the nervous system, caspases are activated during neuronal pruning related to learning and memory, notes Scott Dixon, a chemical biologist at Stanford University, so caspase activation may not be a definitive marker for apoptosis. Montell and her colleagues note that one way to distinguish anastasis activity from other goings-on involving caspases is that non-apoptotic caspase activation typically happens in specific stages of development and in every cell of the same type in a tissue. In contrast, during development, anastasis can occur in random fractions of cells sporadically over time.10 Montell agrees that more research is needed to understand what exactly is taking place. Assuming cells can under some circumstances bounce back from apoptosis and other seemingly fatal processes, it is still unclear how general or important such recovery is. 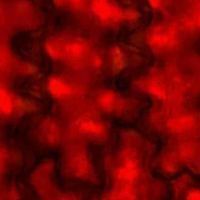 “It is a new field,” says cell and molecular biologist Shoukat Dedhar at the University of British Columbia. In addition to validating the early findings put forth by the Tangs, Montell, and others, he adds, researchers in the field must still demonstrate the relevance of cell death recovery. Fragmented mitochondria glue themselves back together, while a subset of mitochondria remain intact or partially functional to supply energy to help cells recover. Messenger RNAs that accumulate before the cells die from apoptosis could support a quick recovery. 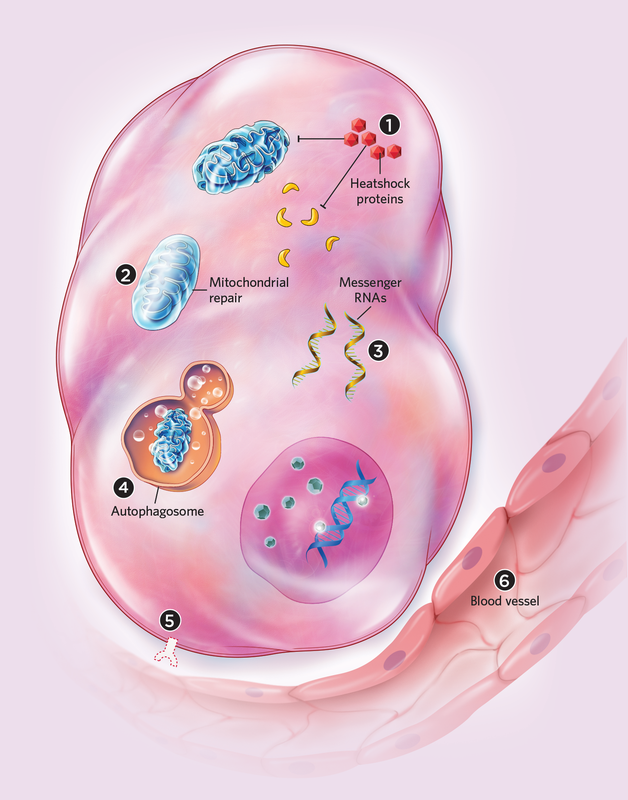 Damaged proteins, mitochondria, and other cellular components are removed, possibly via autophagy and other mechanisms. Cells lose the phosphatidylserine “eat me” signal from their surfaces. Anastasis can induce angiogenesis and cell migration, which could enhance nutrient absorption and remove waste resulting from apopto­sis. It can also arrest the cell cycle to give the cell time to repair. Anastasis may also promote evolutionary change, Tang says. “Our recent studies demonstrated the occurrence of anastasis in germ cells of Drosophila after transient exposure to physiological and environmental stresses such as starvation or cold shock,” he notes.9 This raises the possibility that these cells might acquire new mutations generated during apoptosis that could be passed on to progeny. The revelation might change how scientists define life and death on the cellular level. Tang and his colleagues have also found that anastasis can activate genes in Drosophila linked with angiogenesis and cell migration,7 processes that could enhance nutrient absorption and remove waste to help cells recover from apoptosis, he says. At the same time, these changes could enhance the spread of cancer cells. Anastasis is not the only way to grant cells a stay of execution. Last year, in experiments involving gene silencing in cultured mammalian cells, immunologist and cell biologist Yinan Gong of the University of Pittsburgh Medical Center and his colleagues unexpectedly found that another form of programmed cell death, necroptosis, can also reverse. In necroptosis—a programmed version of necrosis, a form of cell death linked with uncontrolled reactions to injuries or stress—a protein known as mixed lineage kinase-like (MLKL) opens holes in the plasma membrane, rupturing cells. Gong and his colleagues found that necroptosis does not always prove fatal. Instead, the ESCRT-III protein complex can isolate these holes onto bubbles in the plasma membrane. Shedding these bubbles then repairs the cells, a process the scientists dubbed “resuscitation.”10 The team hypothesizes that necroptosis happens when MLKL essentially overwhelms ESCRT-III. 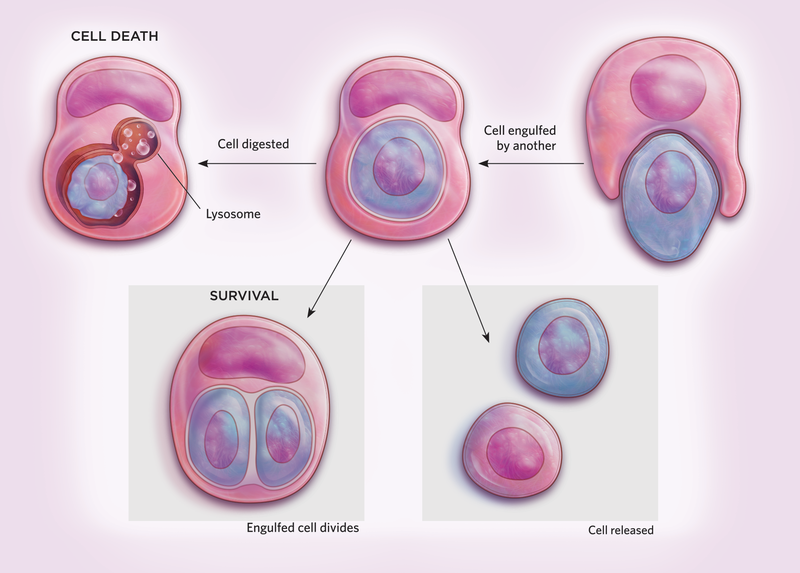 Even the striking form of cell death known as entosis, in which one cell swallows another alive, is reversible, with engulfed cells potentially emerging to continue living. 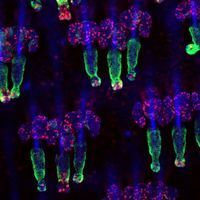 “When a cell is engulfed, its nucleus can look fine, its plasma membrane can look fine, and with time-lapse video, we found it can get out and divide and do fine,” says Mike Overholtzer, a cell biologist at Memorial Sloan Kettering Cancer Center in New York. “Cells can even divide while engulfed and emerge and be perfectly viable.” He and his colleagues have found that entosis is prevalent in human cancers, and triggers for it include detachment from the extracellular matrix and glucose withdrawal,11 but what determines an engulfed cell’s fate is still unclear. Charles Q. Choi is a freelance science writer living in New York. H.L. Tang et al., “Reversibility of apoptosis in cancer cells,” Br J Cancer, 100:118–22, 2009. H.L. Tang et al., “Cell survival, DNA damage, and oncogenic transformation after a transient and reversible apoptotic response,” Mol Biol Cell, 23:2240–52, 2012. G. Ichim et al., “Limited mitochondrial permeabilization causes DNA damage and genomic instability in the absence of cell death,” Mol Cell, 57:860–72, 2015. H.M. Tang et al., “Detecting anastasis in vivo by CaspaseTracker biosensor,” J Vis Exp, 132:e54107, 2018. H.M. Tang et al., “Molecular signature of anastasis for reversal of apoptosis,” F1000 Res, 6:43, 2017. G. Sun et al., “A molecular signature for anastasis, recovery from the brink of apoptotic cell death,” J Cell Biol, 216:3355–68, 2017. H.L. Tang et al., “In vivo CaspaseTracker biosensor system for detecting anastasis and non-apoptotic caspase activity,” Sci Rep, 5:9015, 2015. A.X. Ding et al., “CasExpress reveals widespread and diverse patterns of cell survival of caspase-3 activation during development in vivo,” eLife, 5:e10936, 2016. G. Sun, D.J. Montell, “Q&A: Cellular near death experiences—what is anastasis?” BMC Biol, 15:92, 2017. Y.N. Gong et al., “ESCRT-III acts downstream of MLKL to regulate necroptotic cell death and its consequences,” Cell, 169:P286–300.e16, 2017. J.C. Hamann et al., “Entosis is induced by glucose starvation,” Cell Rep, 20:201–10, 2017.